Fun little sketch I started while watching Ellen's booth for Ellen Million Graphics. I know I'll finish it, but I haven't quite settled on which media to use . . .
Gosh! I agree which media is abit of a pickle! With digital you can add that shimmery effect with trails of fairy dust! With watercolour, you can get subtle effects and inks will make it look outstanding. It's up to you really whatever you use we'll like! Jennie says: I'm leaning towards watercolor & ink. I think it needs a natural touch. Loved your work.. good stuff. Yet I'm better than you are! Just joking, I'm okay. 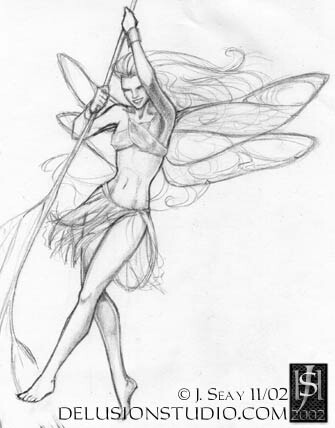 Trouble Making Faerie comes to mind when i look at her-better watch out she might come to life! I thought this sketch was too amature. The sketches I teach to my students are much better than this one. They look much more proffesional compared to yours. I'm just saying you could have added more detail and color to make it pop. But I guess yours was o.k..